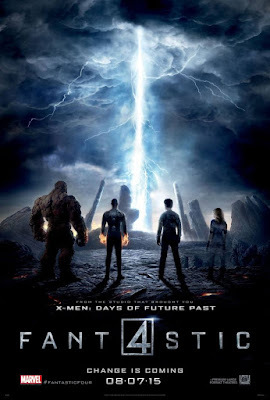 Fantastic Four is a gormless film, containing little to engage moviegoers. Even those invested in superhero lore are likely to leave the theater unsatisfied. Yes, there are superficially interesting characters and special effects that would be considered witchcraft by filmmakers 100 years ago. Yet, the film assembles its characters and special effects in an utterly unsatisfying manner. Sure, the film progresses though a beginning, middle and end, but each scene has no resonance to the preceding one. Everything in the film kind of "just happens." The film reveals very little about the four, not even if they are friends. Sue and Johnny Storm, Ben Grim and Reed Richards assemble at the Baxter Foundation's College in Manhattan to construct a groundbreaking teleporter. When testing the teleporter, though, the team leaves Sue behind, despite waiting 40 minutes for another member. The teleporter itself takes the majority of the film's runtime to build, it's construction detailed largely though montage. Much is made of the scientific qualities of the team, yet when they visit an unknown dimension, quarantine protocols seem to be haphazardly enforced. Sue and Johnny Storm are adoptive, interracial siblings. Somehow Fantastic Four even makes this relationship mundane, missing much of the drama that could have been drawn from this setup. Likewise, Ben Grimm and Reed Richards are childhood friends who spend little time together as adults. Instead of detailing its lead, Fantastic Four spends most of its time "World Building," setting up a half dozen characters and sequels. Unlike a serial TV shows, movies only have 2 hours to tell a story. If the movie bombs at the box office, there is no episode two to tie up lose ends. The entirety of Fantastic Four seems devoted to setting up a sequel as much, as if not more, as telling the story at hand. Serial movies aren't the problem, nor are they a new phenomenon. Fictional detective Charlie Chan has appeared in over 40 films since the 1920s. Mega-budget, every-thing to everyone filmmaking, however, is the problem. Instead of taking risks on smaller films, or utilizing the mini-series format to tell serial stories, the same origin stories keep being rebooted to diminishing returns. The same stories keep being told to higher, and higher stakes as a result of higher budgets and increasingly convoluted production deals. It's a losing proposition for studios, filmmakers and audiences. Fantastic Four isn't a terrible movie. It's a bland one. Nothing in the film really stands out as fantastic despite new dimensions, superheros and government black sites all being part of the plot. A better movie always appears to be around the corner, but never arrives. Spot on. I was more interested in the previews before the movie than I was at any point during Fantastic 4.